Emerson Electric Co. EMR recently won fresh contracts from Fabbrica Italiana Sintetici (‘FIS’) — the renowned pharmaceutical product manufacturer of Italy. The company will provide its state-of-the-art automation technology to digitalize and enhance operational efficiency of the three Italian production facilities of FIS. Emerson’s share price remained nearly flat at 77.75 per share, post the broadcast of this $20-million contracts news on Sep 12. Prior to this, the two companies had inked a partnership deal in 2017, per which Emerson had deployed its DeltaV distributed-control system to control and monitor FIS Termoli manufacturing site. Per the fresh contracts, Emerson will incorporate additional control and measurement instrumentation in FIS Lonigo, Montecchio and Termoli manufacturing sites. Also, the company will also apply its Syncade manufacturing execution system in Termoli and Montecchio manufacturing facilities. Emerson’s new automation technologies will craft a complete electronic manufacturing environment, and enhance the quality, document control, inventory setup, regulatory compliance and efficiency of the three production facilities of FIS. As noted by the company, the latest contracts are part of the 10-year agreement signed by FIS and EMR. Per the agreement, Emerson will provide its Syncade and DeltaV systems, control valves, and measurement instrumentation in the manufacturing facilities of FIS. These contracts can also be categorised under the 10-year service agreement signed by Emerson to provide control systems in FIS Lonigo, Montecchio and Termoli sites, as well as deploy its new manufacturing execution systems in the latter two. 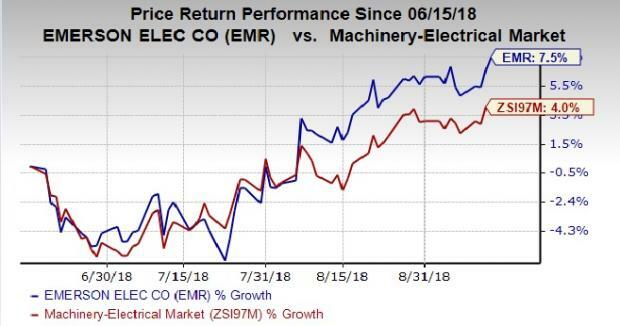 Over the past three months, Emerson’s shares have rallied 7.5%, outperforming 4% growth recorded by the industry. ESCO Technologies Inc. ESE carries a Zacks Rank #2 (Buy). The company pulled off an average positive earnings surprise of 7.04% over the trailing four quarters. You can see the complete list of today’s Zacks #1 Rank (Strong Buy) stocks here. Ideal Power Inc. IPWR also holds a Zacks Rank of 2. The company delivered an average positive earnings surprise of 18.09% over the preceding four quarters. SPX FLOW, Inc. FLOW is another Zacks #2 Ranked company. The company came up with an average positive earnings surprise of 8.20% during the same time frame.